kt literary » Blog Archive » THE OPERATIVE by Gerald Brandt in paperback today! 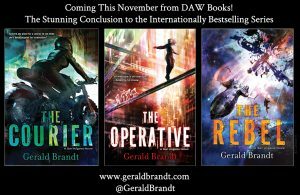 Internationally bestselling author Gerald Brandt wraps up his cyberpunk trilogy this month with THE REBEL (November 14, 2017 from DAW Books). 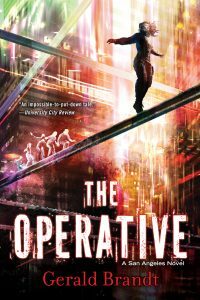 Before getting to THE REBEL, though, pick up THE COURIER (Book #1) and, as of today, THE OPERATIVE (Book #2) – now available in mass market paperback! With the help of a retired operative with PTSD, and the mysterious man who fled the scene when Kris’s parents were killed, Kris searches for any sign of Ian. As the corporations battle civil unrest—and each other—the city slowly shuts down. Kris and San Angeles are running out of time…. Read an excerpt of THE COURIER here! Read an excerpt of THE OPERATIVE here! ← IMMORTAL ARCHITECTS hits the Borderlands bestseller list!